The 2" diameter coarse (680027) in the table below are typically used to clean and buff aluminum tire rims. Click here for added discounts on that item. For holders click on the picture at right. 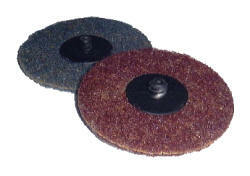 For H&L style SCD discs click here. All below are Type R quick change discs.